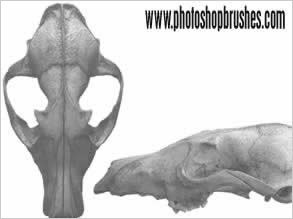 Photoshop Fox head skull brushes, this set features two fox skull brushes. The original digital shots are looking down on the skull from above and a side view. I don't know how long the fox had been dead but I didn't find any front teeth in the skull which is a shame. I have talked to the gamekeeper from the nearby shoot and after explaining what I was after (and after looking at me in a very odd way) said he would look to see if there were any Fox skulls with teeth, will be adding some really big versions of these soon. There are lots more Skull Photoshop Brushes available on my site featuring Weasel, Rabbit and Cat skulls to name but a few.